#CancelColbert worked, y'all! When David Letterman retires in 2015, Stephen Colbert is taking over The Late Show . It's a win-win situation for those of us who love Stephen Colbert and those of you who hate The Colbert Report. Huzzah! We're all happy now, right? Everyone can come together in a year and start watching a channel that was previously reserved for old people and sports fans. It'll be great. But until then, there are some very important questions to answer: Will Stephen Colbert be hosting The Late Show or will "Stephen Colbert" be hosting The Late Show ? Will he still walk over to his guests instead of the other way around? 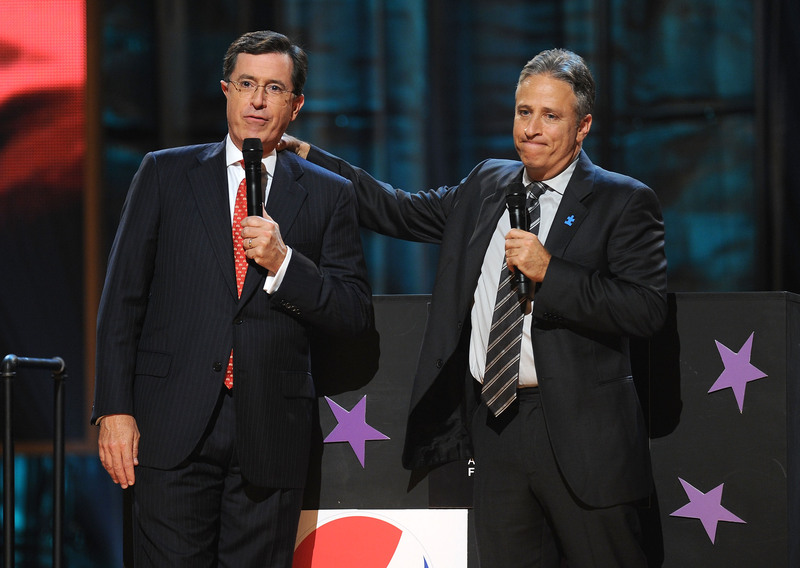 Does this — I'm sorry this is really hard to bring up — Does this mean that Colbert is officially bigger than Jon Stewart? Yes. Yes it does. Before this news, one could ask the question, "Who do you prefer, Jon Stewart or Stephen Colbert?" and then have a long thoughtful conversation about whose show best delivers the news in a humorous and sometimes offensive-if-taken-out-of-context way without the phrase, "Well, Colbert hosts The Late Show so..." being included. This changes everything. Colbert got his start on The Daily Show, so not only did he reach the same level as Stewart by getting his own news show, he's now taking over a show on a major network. The student has not just become the master, the student has surpassed the master. The student became the master nine years ago when he got his own show, but then he kept on trekking, won a few Emmys, and capped it off by becoming the replacement for David Letterman. This is exactly what "Stephen Colbert" would want! It might also be exactly what Stephen Colbert would want, but he'd just be less in yo' face about it. And by "yo' face" I mean Jon Stewart's face because I'm really hoping Colbert brings all of this up on tonight's episode. This doesn't mean you have to like Stephen Colbert better than Jon Stewart — I'm assuming those of you who are confused by things like The Onion will always hate him — but it does mean that he's going to be a bigger name that Stewart because The Late Show is huge and it's on the always shockingly popular CBS. Conveniently, you won't have to give up on either of the guys when Colbert moves to The Late Show. Stewart starts at 11 p.m. and Colbert will still be in his regular time slot at 11:30. For now, check out Colbert doin' his thing back in the day on The Daily Show.